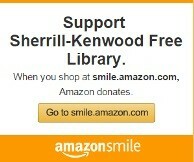 The mission of the Sherrill-Kenwood Free Library is to provide materials, programs, and a community center to meet the educational, cultural, recreational, and informational needs of all members of our community. It seeks materials in varying formats to provide current, accurate, useful, and timely information to assist individuals in their pursuits. The library strives to provide services of interest and benefit to individuals of all ages and abilities. The Sherrill-Kenwood Free Library wholly embraces the principles outlined in the American Library Association’s Freedom to Read Statement and the Library Bill of Rights. Circulation of books and other materials including DVDs, audio books, newspapers, magazines, and large print books. Reference services. Ask us a question in person, on the phone, or through email. Programming including educational, recreational, and cultural activities for all ages. Listening center with headphones and a selection of materials is available in the children’s room. Free Wi-Fi, public access computers, and printers. Printouts are $.25 per page. Please sign up at the circulation desk for computer use. Fax and copier are available for public use. Faxes are $1.00 per page, sending or receiving, with cover sheets available. Copies are $.25 a page. Ability to request materials from all other Mid-York libraries. Interlibrary loan is available for free for titles not within the Mid-York system. Free online access to numerous databases and online resources for free through Mid-York. Community room available for group meetings. Please call ahead to reserve the room. Items may be renewed two times with the exception of new books, DVDs, or items that are in demand. Library privileges are suspended if you exceed $5.00 in fines on your account.